The urgency of the climate crisis is a daily reminder that we must take action. Keep in mind that August 1 marked 2018’s Earth Overshoot Day, the day by which humanity has consumed more resources than could be regenerated by our planet in one year. The major players – nations, NGOs, and businesses – have not been idle. Three years ago, the Paris climate agreement gave us a better view of the issues. At that meeting we agreed that it’s essential to limit the increase in global temperature to less than 2°C, compared to the pre-industrial level, if we want to avoid a major ecological disaster. But it’s not enough. A report issued last October by Intergovernmental Panel on Climate Change (IPCC) highlights a number of climate change impacts that could be avoided by limiting global warming to 1.5ºC compared to 2ºC or more. That’s why COP24 is expected to see a push for countries to adopt even more ambitious goals, limiting global warming to 1.5°C. This would require “rapid and far-reaching” transitions in land, energy, industry, buildings, transport, and cities. By 2013, global net human-caused emissions of carbon dioxide (CO2) would need to fall by about 45 percent from 2010 levels, reaching ‘net zero’ around 2050. At Schneider, we believe that sustainability and innovation make the fight against climate change technologically possible today. And we know they can be an engine of economic growth and social inclusion. That’s why we’ve challenged ourselves and our network to rethink the future and achieve the 2030 Sustainable Development Goals, covering economic growth, social inclusion, and environmental protection. 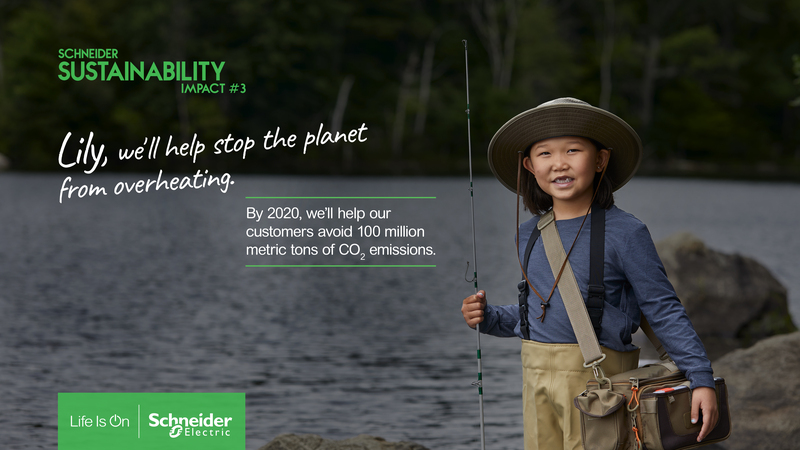 With the Schneider Sustainability Impact, we’re tracking our progress in a quarterly basis. We signed the Science Based Targets initiative in 2016 to reduce our emissions, and we are also helping our customers adopt ambitious targets that spur innovation as well as profitability. Businesses have long recognized the need to decarbonize operations through setting GHG emission reduction targets, but these goals are typically short-term and incremental in nature – usually based on past performance or regulatory requirements. Science Based Targets (SBTs) are far more ambitious and go beyond current legislation. Businesses are also concerned about sustaining their operations in a world with finite resources. A recent survey of Schneider Electric clients indicates that 82% take sustainability and resource availability into consideration in their decision-making. The good news is that we have solutions available now. Together with Global Footprint Network, Schneider estimates that commercial technologies for buildings, industrial processes, and electricity production alone could move the date of Earth Overshoot Day at least 21 days in the right direction. Today, around 50% of our solutions (via EcoStruxure) are connectable, helping our customers all over the world to make the most of their electricity while reducing their costs and carbon footprints. By 2020, we aim to avoid 100,000 million metric tons of CO2 on behalf of our customers, thanks to such technologies. For COP24, we are launching an e-book to demonstrate the many possibilities for business to embrace more ambitious goals while building a business case. Nevertheless, the fight against climate change will not be effective if we don’t take into account the needs of the 2.3 billion people with poor access to energy. Energy poverty is a global issue – affecting an estimated 11% of Europe, for example – and combatting it requires a global mindset. That’s why Schneider Electric is actively promoting sustainable energy access everywhere. In committing to achieving carbon neutrality by 2030, one of our strategic ambitions is to quadruple the number of people gaining access to energy through the aid of our solutions. In other words, we’re talking about roughly 80 million people with access to energy gained since 2009, when the program was created. However, these solutions will only be sustainable if they include the training of future players in the new electric world – a more decarbonized, decentralized, and digital world. These future professionals will be able to respond to the challenges of urbanization, industrialization, and digitization. Solutions are ready to help provide clean, reliable electricity to at least three-quarters of the population living in a state of energy poverty, but there just aren’t enough entrepreneurs or trained workers to deliver these solutions. Schneider’s Access to Energy program has already helped train 200,000 underprivileged people globally. The goal to be achieved by 2020 is to train 350,000 people trained in energy management worldwide. By partnering with Power for All, an international NGO, on their #poweringjobs campaign we will contribute to this goal. The #poweringjobs campaign brings together large and small companies, multilateral agencies, trade associations, research institutions, and civil society organizations, all with the intent to elevate skills and trainings, and to ensure universal access to electricity for one billion people. As our CEO, Jean-Pascal Tricoire, often says: “When it comes to climate change, I’m neither an optimist nor a pessimist. I’m an activist.” And so are we! As long as we continue to take responsible, innovative action, we can ensure a more sustainable world.